If you have lost a tooth or several teeth for any reason, the ultimate solution is a dental implant. This treatment begins with the surgical implanting of a titanium post into your jaw. The embedded post serves as a root for the attachment of dentures, crowns, or bridges. The implant is basically an artificial root for restored teeth. This is a more comfortable and practical solution than a removable partial denture. Most patients find this solution to be far more attractive. Dr. Paul Athanasius and his staff at Genuine Family Dentistry provide quality dental implant treatment for the Orange, CA, community. With the proper maintenance, dental implants can provide restored function and a natural look for a lifetime. Dental implants are placed through a series of steps. It begins with x-rays and impressions of your jaw and teeth. Next, the health of your bone structure and gum tissue is diagnosed and the necessary spacing between your surrounding teeth is determined. Based upon the diagnosis and subsequent treatment plan, the titanium rod is surgically implanted into the bone structure of your jaw. After allowing the gums to heal for 8-12 weeks, the necessary artificial tooth or teeth is attached to the implanted post. The length of the procedure varies with each patient. Your dentist will want to ensure that proper healing and fitting is occurring at each stage. Ultimately, your overall oral health and the appearance of your smile will be strengthened by dental implants. There is no more stable tooth replacement option available for those with missing teeth. By maintaining existing bone structure, dental implants will also strengthen the natural teeth that are still remaining. Dental implants also provide completely natural looking replacement teeth. By stabilizing your mouth and tooth structure, dental implants enhance your overall oral health. The delicacy and precision required for dental implant placement requires the work of a skilled and knowledgeable dentist. Dr. Paul Athanasius has developed the knowledge and skill required to provide excellent dental implant treatment for those in the Orange, CA, community. 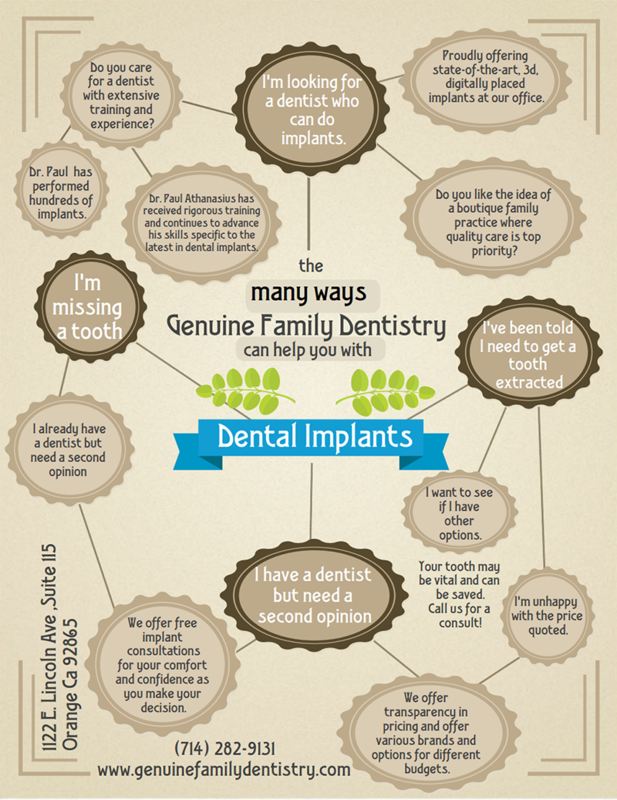 Please contact the staff at Genuine Family Dentistry and arrange a consultation today!